I activated the "C2ISTAR" Module option to allow Intel on Map and wonder what is the difference between this intel information and the one I can see within the C2ISTAR Intel menu. These infos are pretty much more detailed but also very confusing for me. Shows actual enemy profiles. They also have the ALiVE number IDs i.e. e34, e101, e12, etc. I find this odd. Will it be replaced by NATO icons in the future? I find the second options pretty good to be honest because these intel are pretty immersive. But I do not understand why these two ways of giving intel are separated? Is there a future plan to merge them together but at the moment they simply are tested out on their own? They're for different use cases and play styles. Map intel is approximate location of friendly forces and any enemy seen so players know roughly where the action is and will work for any setup. C2ISTAR simulates a friendly radio net giving detailed sitreps of what the AI Commander is doing. It needs an AI Commander module to work properly. When you say sitrep - will my custom SitReps that I can produce through C2ISTAR leave a mark on the map as well? So other player squads can see my reports through this "simulated friendly network" ? 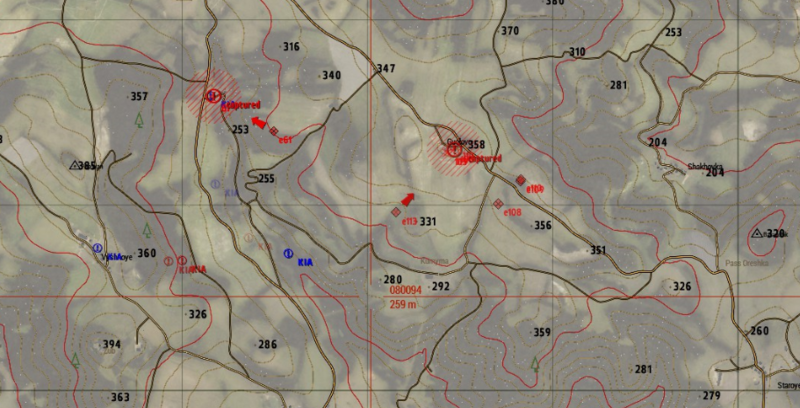 Sitreps, Patrolreps and Spotreps (the latter added via ALiVE advanced markers) all leave markers on the map or can be cross referenced to existing advanced markers so other players can follow up. A typical scenario is players conducting a recce patrol. They'll place Spotreps at identified targets, fill in a Sitrep every few hours and a patrolrep at the end of the patrol. Typically I get my patrol commanders to leave a sitrep when they're on a multisession patrol (i.e. they're technically still out on patrol even if they've logged for the night). Patrol reports are sent once they've completed the objective and returned to base. As a mission maker, I use the summary of patrol reports to write orders for the next phase, order in resupplies as required and leave a a bunch of Player Tasks in the mission for the next patrol to pick up. I find this works well because it encourages the players to return to base in good order so they "qualify" for resupply and new missions. @Friznit; thanks for that explanation. I'm going to incorporate that type of intel method on my server Alive campaigns, to give more 'direction' and purpose. How do you write and implement orders for the next phase? A simple briefing screen for the follow-up tasks or something?